Hello everyone. 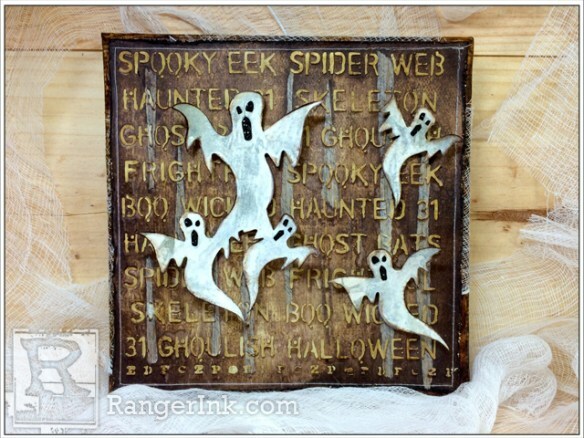 I’m excited to be here at the Ranger Blog with a tutorial for a ghostly Halloween themed mixed media canvas. 1. To begin, cut a piece of Ranger watercolor cardstock (7.5 x 7.5 inches) and ink up with Old Paper and Frayed Burlap Distress Ink. 2. 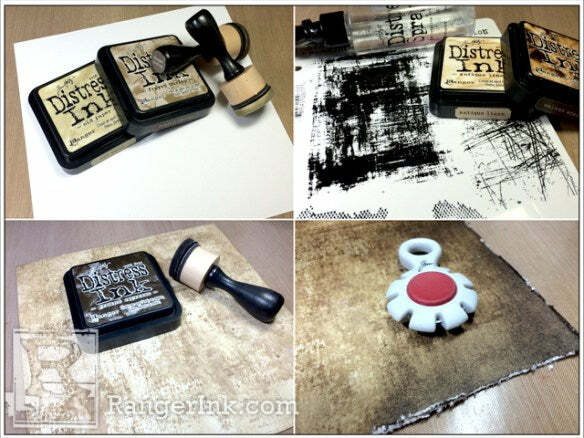 Ink background stamps with Antique Linen and Walnut Stain Distress Ink, lightly mist with water and stamp on the top of the cardstock. Dry with a Heat it Craft Tool. 3. Lightly blend Ground Espresso Distress Ink over the top of the base colour and stamped background. 4. Distress edges with a paper distresser tool. 5. Ink the edges with ground espresso distress ink. 6. Tear strips of tissue tape and stick to a Non-Stick Craft Sheet. Cover with Picket Fence Distress Paint and allow to air dry. 7. Stick the strips of tissue tape to the watercolor cardstock as pictured. 8. Spread texture paste through a stencil with a palette knife, allowing to air dry before moving the stencil and repeating. 9. 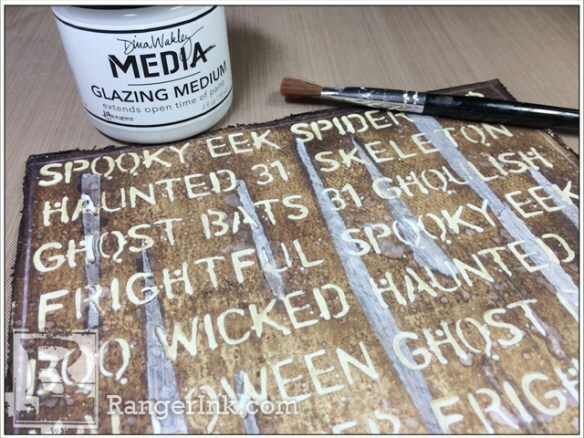 Once the texture paste is completely dry cover the entire background with glazing medium. 10. Cover the sides of an 8 inch x 8 inch canvas with dictionary pages overlapping the top of the canvas slightly, using Glue ’N Seal. 11. Spray generously with Walnut Stain Distress Spray Stain (don’t worry about the middle of the canvas as this will be covered). 12. 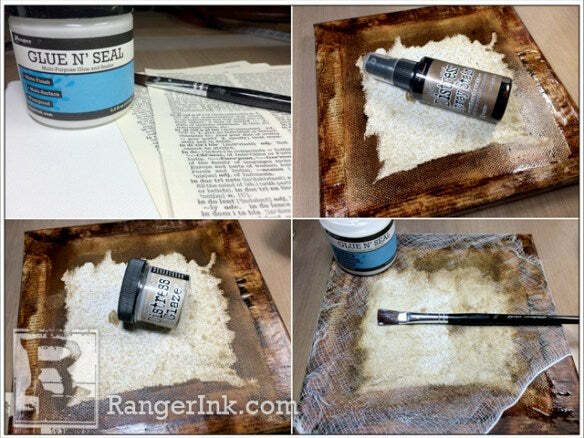 Once dry, rub Distress Micro Glaze over the stained dictionary paper and buff with a cloth. 13. Cover the canvas with Glue ’N Seal and immediately lay a piece of cheesecloth over the top, wrapping over the edges and secure at the back of the canvas with more Glue ’N Seal. 14. Die cut 2 ghosts from Mixed Media Cardstock with the Tim Holtz Ghost Bigz die. 15. Dab Picket Fence Distress Paint onto a Non-Stick Craft Sheet and spritz with water. Drag the die cut through the spritz paint and set aside to air dry. 16. 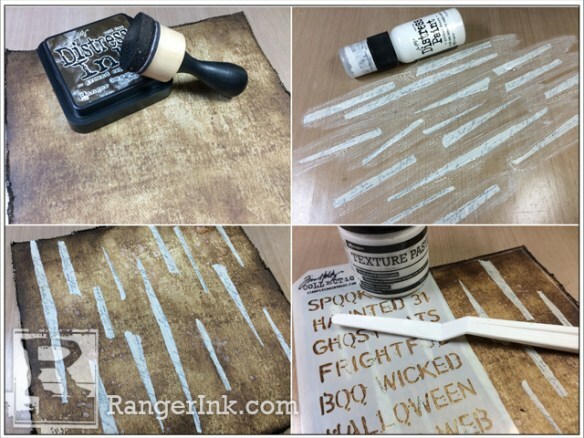 Swipe Old Paper and Hickory Smoke Distress Ink across a Non-Stick Craft Sheet and spritz with water. 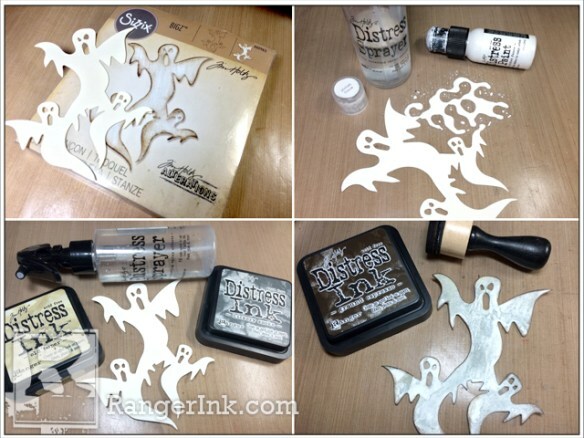 Drag the die cut ghosts through the spritzed ink. Repeat this several times until happy with the colour streak. 17. 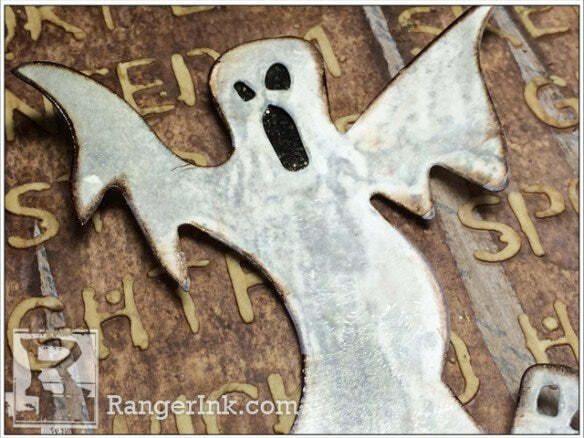 Once dry, cut the bottom ghosts away from one die cut and ink the edges with Ground Espresso Distress Ink and repeat with the other complete die cut. 18. 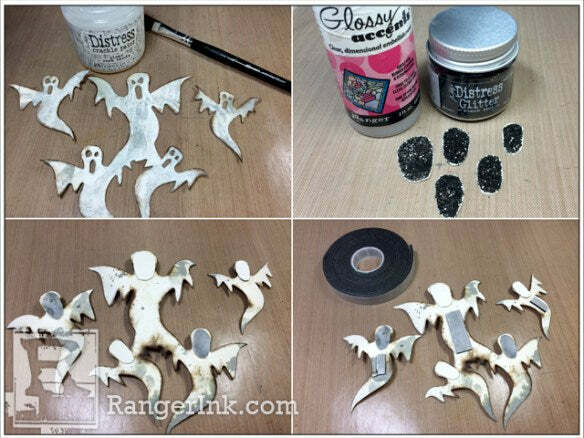 Paint Clear Rock Candy Distress Crackle Paint onto the ghost die cuts. 19. 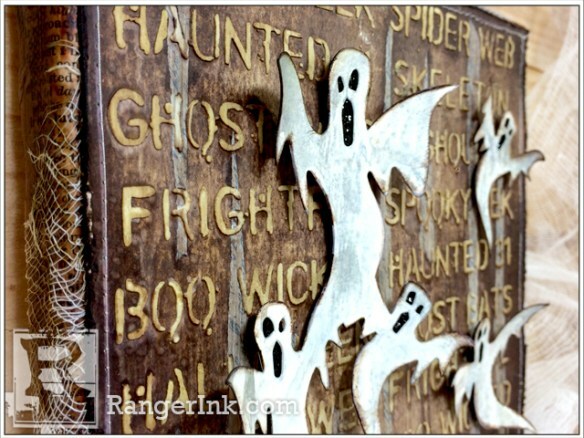 Cut ovals slightly smaller than the ghost heads from Mixed Media Cardstock. Cover with Glossy Accents and sprinkle Black Soot Distress Glitter over the top and set aside to air dry. 20. 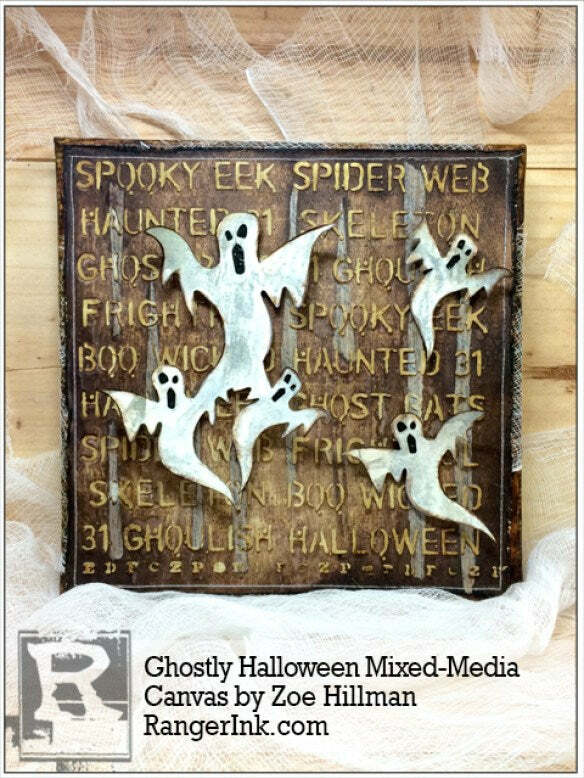 Apply Glossy Accents to the back of the ghost heads and stick down the glittered ovals. 21. Add black Adhesive Foam strips to the back of the ghost die cuts. The ghosts are now ready to attach to the canvas. 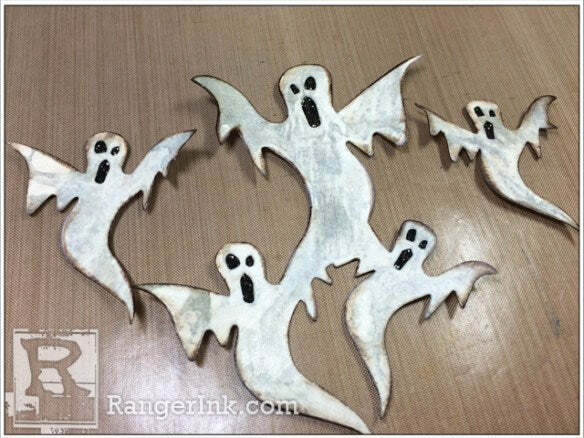 Thanks for joining me and I hope you’ll find some time to make your own home decor pieces this Halloween. Hello I’m Zoe, a British 30-something crafter and shopaholic. I moved to Geneva, Switzerland 7 years ago to live with my (now) husband. About 5 years ago I bought Tim Holtz’s Compendium of Curiosities book and I was hooked! I now live, love, breath and shop craft. I love being a member of the online craft community. I am a keen social media user, with a blog, instagram account and an active facebook group for Tim Holtz Addicts. I am currently studying French and hope to gain a professional qualification so I can teach, (as well as communicate with crafters in a foreign language)!